Lady Isabel Carlyle, a beautiful and refined young woman, leaves her hard-working but neglectful lawyer-husband and her infant children to elope with an aristocratic suitor. After he deserts her, and she bears their illegitimate child, Lady Isabel disguises herself and takes the position of governess in the household of her husband and his new wife". . . .They are for East Lynne," he quietly replied. "Oh, for the Carews." And Barbara's interest in the item was gone. They turned into the road just below the grove, and reached it. Mr. Carlyle held the gate open for Barbara. "You will come in and say good-night to mamma. She was saying to-day what a stranger you have made of yourself lately." "I have been busy; and I really have not the time to-night. You must remember me to her instead." And cordially shaking her by the hand, he closed the gate. It was two or three mornings after the departure of Mr. Carlyle that Mr. Dill appeared before Miss Carlyle, bearing a letter. She was busy regarding the effect of some new muslin curtains, just put up, and did not pay attention to him. "Will you please take the letter, Miss Cornelia? The postman left it in the office with ours. It is from Mr. Archibald." 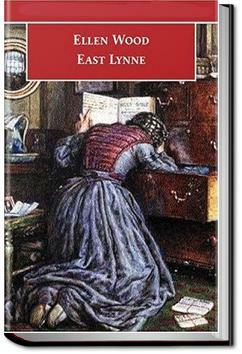 East Lynne is an English sensation novel of 1861 by Ellen Wood. A Victorian best-seller, it is remembered chiefly for its elaborate and implausible plot, centering on infidelity and double identities. There have been numerous stage and film adaptations. Well that was one of the most exciting Victorian novels I've ever read. Fascinating themes, poignant characterisation and wonderful plotting - I'd highly recommend!